Indians Baseball Cards: Nightmares on Cardboard III is open! Wahoo! Oh, yeah!! 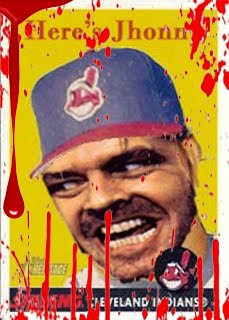 Okay, folks, Thorzul has officially opened the gates to his annual horror-based baseball card contest! This year, the only "rule" seems to be that the card must be based on a design of Topps between 1970-1990. Anything else goes. Sweet!